Before her tragic death soulful rock singer, Amy Winehouse ordered 12 tracks she had recorded to never be released. Island Records UK says that they will honor Amy's wishes but exec Ted Cockle says one song, Procastinate, would have been a hit! Amy's posthumous album, Lioness: Hidden Treasures, will go on sale on December 5. It's such a shame to loose anyone this young and with the talent and energy as Winehouse. I must admit I didn't pay as much attention to her music until after her tragic death. Once I did I realized just how brilliant she was. In a music world that sometimes sounds like sound effects and technology on acid it's sad an artist with incredible raw, personal music left us. By the way, what do you think of this photo of Amy? Simply beautiful I must say! Though, this Nashville boy thinks tatoos on women is a major turn off, I love any gal's hair that you could hide a shotgun in. The higher the hair the better. Are you going to check out Amy's Lioness: Hidden Treasures? 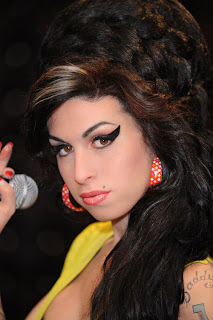 I'm going to miss Amy; she was an amazing singer, and she was pretty, minus the tattoos. Rest in peace, Amy. AMA Recap- Taylor Did Nashville Proud! Alabama's Reuniting for 2012 Tour!